Let's continue our short tour of data structures for storing words. Today, we will over-optimize John Resig's Word Game. Along the way, we shall learn about a little-known branch of computer science, called succinct data structures. One of the best data structures for searching a dictionary is a trie. The speed of search does not depend on the number of words in the dictionary. It depends only on the number of letters in the word. For example, here is a trie containing the words "hat", "it", "is", and "a". The trie seems to compress the data, since words sharing the same beginnings only show up once. We need to solve two problems. If we transmit the word list to the web browser, it then has to build the trie structure. This takes up a lot of time and memory. To save time, we could pre-encode the trie on the server in JSON format, which is parsed very quickly by the web browser. However, JSON is not a compact format, so some bandwidth is wasted downloading the data to the browser. We could avoid the wasted bandwidth by compressing the trie using a more compact format. The data is then smaller, but the web browser still has to decompress it to use it. In any case, the browser needs to create the trie in memory. This leads us to the the second major problem. Despite appearances, tries use a lot of memory to store all of those links between nodes. Fortunately, there is a way to store these links in a tiny amount of space. Succinct data structures were introduced in Guy Jacobson's 1989 thesis, which you cannot read because it is not available anywhere. Fortunately, this important work has been referenced by many other papers since then. A succinct data structure encodes data very efficiently, so that it does not need to be decoded to be used. Everything is accessed in-place, by reading bits at various positions in the data. To achieve optimal encoding, we use bits instead of bytes. All of our structures are encoded as a series of 0's and 1's. select(y) - returns the position of the yth 1. This is the inverse of the rank function. For example, if select(8) = 10, then rank(10) = 8. Corresponding functions exist to find the rank/select of 0's instead of 1's. The rank function can be implemented in O(1) time using a lookup table (called a "directory"), which summarizes the number of 1's in certain parts of the string. The select() function is implemented in O(logn) time by performing binary search on the rank() function. It is possible to implement select in constant time, but it is complicated and space-hungry. Here's a trie containing the words "hat", "is", "it", and "a". First, we add a "super root". This is just an additional node above the root. It's there to make the math work out later. We then process the nodes in level order -- that is, we go row by row and process the nodes left to right. We encode them to the bit string in that order. In the picture below, I've labeled each node in level order for convenience. I've also placed the nodes encoding above it. The encoding is a "1" for each child, plus a 0. So a node with 5 children would be "111110" and a node with no children is "0". Now, we encode the nodes one after another. In the example, the bits would be 10111010110010000. I've separated them out in this table so you can see what's going on, but only the middle row is actually stored. We then encode the data for each node after that. To get the data for a given node, just read it directly from that node's index in the data array. The main thing that we want to do with a trie is follow links from each node to its children. Using our encoding, we can follow a link using a simple formula. If a node is numbered i, then the number of its first child is select0(i + 1) - i. The second child is the one after that, and so forth. To obtain the number of children, look up the first child of the i+1th node and subtract, since they are stored consecutively. For example: We want the first child of node 2. The 3rd 0 is at position 7. Seven minus two is five. Therefore the first child is numbered 5. Similarly the first child of node 3 is found to be 7 by this formula (no, it doesn't really exist, but it works for the calculation). So node 2 has 7 minus 5 equals 2 children. Here is a demonstration, hosted on my faster server. (Source code: Bits.js) (It doesn't work in RSS readers -- go to my blog to see it. Paste a list of words in the top text area (or click Load dictionary to load one). Click "Encode" to create the trie and encode it. This step can be very slow, because I did not optimize the encoding process. Once encoding is complete, you can use the Lookup button to check if words are in the dictionary. Using this encoding method, a 611K dictionary containing 80000 words is compressed to 216K, or 132K gzipped. The browser does not need to decode it to use it. The whole trie takes as much space as a 216K string. The directory contains the information needed to compute the rank and select functions quickly. 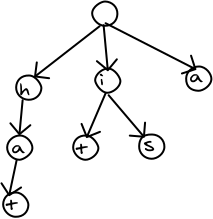 The trie is the bitstring representing the trie and the connections between all of its nodes. To avoid problems with UTF encoding formats and escaped characters, the bit strings are encoded in BASE-64. All of the bit decoding functions are configured to operated on BASE64 encoded units, so that the input string does not need to be decoded before being used. We only handle the letters "a" to "z" in lower case. That way, we can encode each letter in 5 bits. You can decrease space usage and performance by increasing the L2 constant, and setting L1 = L2*L2. This controls the number of bits summarized in each section of the rank directory. L2 is the maximum number of bits that have to be scanned to implement rank(). More bits means fewer directory entries, but the select() and rank() functions will take longer to scan the range of bits. I described how to create an MA-FSA in a previous article. There is no known way to succinctly encode one. You must store one pointer for each edge. However, as the number of words increases, an MA-FSA (also known as a DAWG) may eventually become more compact than the trie. This is because a trie does not compress common word endings together. Images are still badly missing! If you could revive them that would be very nice! Can you please good link the pictures in your article? Without pictures i don't good understand. an optimisation can be done at suffixes (it will be udapted foreach language) for example in eng dic we can use the bits from 27 -> 32 to compress suffixes like[ ing, ise, ted, .. ] we can use extra ascii char for this purpose. ex: replace ing by G, ise by S .. Correct me if I am wrong. But you would still need a dictionary of the kind <bits, string> for doing the lookup? The succinct representation just helps you in traversing the dictionary which is great bonus as you can exploit SIMD and other niceties. "Similarly the first child of node 3 is found to be 7 by this formula (no, it doesn't really exist, but it works for the calculation)"
How come node 7 does not exist? It seems to me that it does and it's node's 4 children? Just like to point out that even if you tried to succinctly encode an MA-FSA, it would not improve asymptotically on the succinct trie. Intuitively its because the tree can represent *any* trie. If you encode within its information theoretic optimum (which succinct does) then its impossible to improve on that. If you did, there would be some instances of trees that you could not encode. So no matter what you do with the MA-FSA you can't improve on that. MA-FSA are only useful in nonsuccint data structures. Because in information-theoretic terms pointers are a terrible way to encode trees. So MA-FSA just improve on a terrible encoding method namely tries. Obviously for speed and ease of use they are great! Finally encoding a MA-FSA is not too difficult if its a *minimal*. Which is the whole point of MA-FSA. Just split it up into levels. 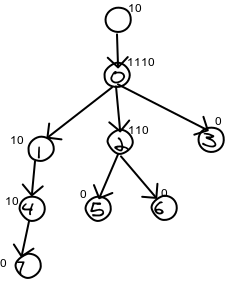 Where each node in level i has at least one node in level i+1 that has a directed edge to it. Then its just a matter of encoding every possible combination of edges. Similar to tree but with obviously far more combinations. Just posting to say I love your blogs/articles. I'm actually trying to compress a single file at the moment and i'm comparing the different algorithms which has been a load of fun. Unicode (actually, anything at all outside of ASCII) breaks this, right? I tried adding the word óle to the dictionary, and lookup fails to find it. Very interesting. Does this encoding scheme support prefix search as well, or just membership tests? I have been in the field for over 25 years and it is amazing how there is new stuff to learn every day. "Huffman coding is very different"
Looks like a cute trick: numbers get encoded essentially in numeric system base 1, which is highly unusual. But how efficient it is from informational perspective? I calculated frequencies for the trie -encoded scrabble dictionary: that is, how many nodes have exactly 0 children, how many nodes have 1 child, etc. Turns out, this encoding is almost Huffman-perfect. There's always more nodes having N children than N+1, and (often) even than N+1, N+2, etc combined, which is exactly what required for the above encoding to be efficient. The only questionable part if 0 children vs 1 child, but it depends on how we treat terminators (that is, whether we add "$" as terminator to mark the end of a word which is a part of another word), but overall, the thing is VERY efficient. I find this combination truly remarkable. Now the crazy part. DNA is all about encoding. I heard there are parts of so called junk DNA (=97% of genome) that, among other strange things, contain long sequences of the same "letter". If there is any biologist reading this blog, my question is: in these sequences of "ones" in DNA, are there at least some zeros in between? The algorithm was written with characters from a-z in mind. To allow more characters, you only need to change the Trie.encode and FrozenTrie.getNodeByIndex functions. They represent a-z as number from 0..26 which fit into 6 bits. (There is no need to touch the ORD and CHR functions. They are not related to the alphabet used). I've always wanted to know more about this topic. This has been a very useful post. Forgive what is perhaps an incredibly naive question, but how could this implementation be extended to include a wider range of characters? I've ported it to another language for the purposes of storing and processing a large amount of street names and numbers. It works very well in general, but there are some cases were it falls over. In these cases spaces, apostrophes, and occasionally numbers, are used as part of the street name. I have tried working with encoding width and extending the range of bits, but I suspect that either my alterations are incorrect, or my understanding of the encoding process is wrong. you use to generate your freehand looking drawings? BlueRaja: I wrote all the code. Nick Tulett: Huffman coding is very different. Wasn't this once called Huffman coding? Where did you get the code for Rank/Select? I'm trying to understand it, but it was clearly not written by the same person who wrote FrozenTrie (which I assume was you). I didn't know these were called succinct data structures, but a few years ago I invented a similar data structure for geospatial addressing of hexagon tesselations. It used only 1 byte per hex: 7 for the sides plus center, and a bit for denoting the end of a sequence. I remember explaining to my colleagues that you don't need to build the tree/trie in memory, you can just perform lookups directly from the data structure, and it's so small it will still be fast. We did implement it, and it was. One correction. You state that using the compressed Trie requires "web browser still has to decompress it to use it". That's not really true. If you look at my PackedTrie implementation, I do lookups directly from the data structure, without having to expand it in memory at all (unless you count calling "split" on the string, "decompressing it"). "In the example, the bits would be 0111010110010000." "In the example, the bits would be 10111010110010000. A DAWG is not a planar graph, and succinctly encoding arbitrary graphs is possible but too difficult. Instead, we have to store a pointer with each edge to another node. Since the number of edges in a DAWG is much smaller than a Trie, there is some promise to using the less complicated DAWG structure. With the 80,000 words they are very close. According to my earlier program, an MA-FSA (or DAWG) containing the same 80000 words contains 61231 edges. So each edge stores a 16-bit pointer to another node, plus 5 bits for the letter. This would result in 160732 bytes. With the 4/3 BASE-64 overhead, this string would take 214310 characters. This is less than the succinct trie. However, we are dangerously close to needing to use more bits for the pointers if more words are used. tba: Thanks I corrected it. select(8) = 10 implies rank(10) = 8, but the reverse is not necessarily true. "For example, if rank(10) = 8, then select(8) = 10"
Isn't this only true if the tenth bit is a 1? The converse appears to always be true. This really should have been included in cairo. Instead, everyone that wants to have shadows has to roll their own blur function. Here's my take on it. I'll even release this into the public domain.